Cynthia Belle Colston-Coates, daughter of Rosa Belle and James R. Colston, Sr., was born in York, Pennsylvania on January 15, 1932. She departed this life at Manor Care South on January 17, 2019, at the age of 87. Her husband, the late Raymond O. Coates, preceded her in death. Mrs. Coates attended William Penn High School in the York City School District. She was a dedicated member of New Psalmist Baptist Church in Baltimore, MD where she was a member of the Chancellor Choir. Her beautiful soprano singing voice was a blessing to all and she joyfully used it to sing glory to God. She also enjoyed singing for family and friends. Mrs. Coates, enjoyed life and family and her favorite theme was the character “Betty Boop.” After many years of service, she retired from Stanley Tool as a toolmaker. In her spare time she enjoyed watching old re-runs of the Martin Lawrence Show. Her favorite movie was the tearjerker “Imitation of Life,” with Mahalia Jackson. She enjoyed the theater and volunteered as an Usher and Greeter at the Strand and Capital Theater. Mrs. Coates shared her time, talent and energy as a volunteer at the York Recreation Parks and as a volunteer for the Foster Grandparent Program at Crispus Attucks Early Learning Center and for the Foster Grandparent Programs at William Penn Senior High School. There, she received the Shining Star Award for her dedication and commitment to the students. Mrs. Coates leaves to cherish her memory four daughters: Sharon L. Coates-Ophori (David) – Atlanta, GA, Rosa B. Brewster (Nelson) – York, PA, Cynthia R. Coates – Atlanta, GA, Tonya M. Coates-Hall (Howard) – York, PA; One son: John A. Coates – Mechanicsburg, PA; Nine Grandchildren: Raena Coates, Woodrow Coates, Latessa Coates, Raven Coates, Larae Coates, Ceirra Coates, James Coates, Laquetta Coates and Ariel Taylor; Ten Great Grandchildren: Taylor Coates, Woodrow Coates, Jr., Lilliana Coates, Aaliyah Coates, Jahsaun Coates, Braydon Coates, Laila Coates, Kevhaun Coates, Jimmya Coates and Jayla Coates and many nieces, nephews and cousins. Cynthia Belle Colston-Coates was preceded in death by her Mother and Father Rosa Belle Manuel Colston and James R. Colston, Sr.; Brothers James R. Colston, Jr.; Manuel Eugene Colston and Cameron G. Colston; Sisters Betty Colston, Lucilli Colston and Victoria Colston-Brown and Sister-In-Law Josie Colston. She is survived by her Sister Dr. Sylvia Colston-Still and Sister-In-Law Irma Colston and Goddaughter Latessa Coates. 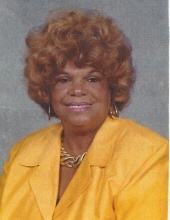 To send flowers or a remembrance gift to the family of Cynthia Belle Colston-Coates, please visit our Tribute Store. "Email Address" would like to share the life celebration of Cynthia Belle Colston-Coates. Click on the "link" to go to share a favorite memory or leave a condolence message for the family.